This website is dedicated to the great Japanese artist Ogata Gekkō (1859-1920). It provides a wide range of resources for those interested in this wonderful artist, including a biography, a catalogue raisonne and other information about his work, including a listing of his signatures and seals. The heart of the site is finished but there are some areas still to be completed. It contains images of several hundred works by him, including images of some very rare prints. It will in time present some superb paintings by this masterful artist. 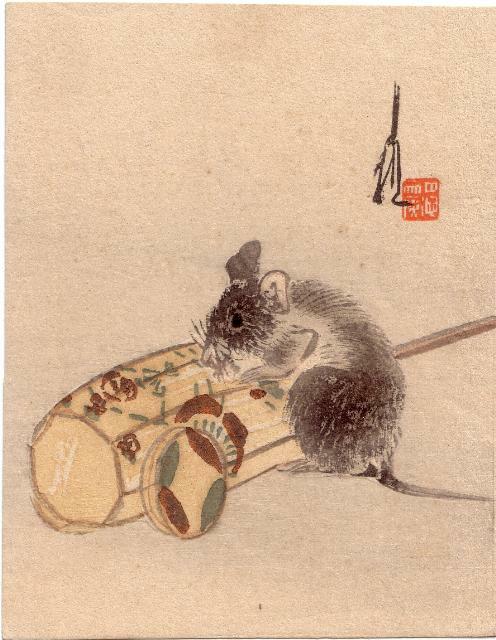 I hope that you will encounter works that you have not seen before, like this little Nezumi with his Buri Buri. I would ask that if you have images not included on the site, please send them to me to upload for everyone's enjoyment. You can access some other Gekkō resources from this page. One is my little blog about Gekkō's paintings The other is a listing of Gekkō's print seals which you can access by clicking on the Nezumi or on the Seals box. "Copyright © David Humphries 2012. All rights reserved. Copying the information and images on this site other than for educational purposes, is strictly prohibited."